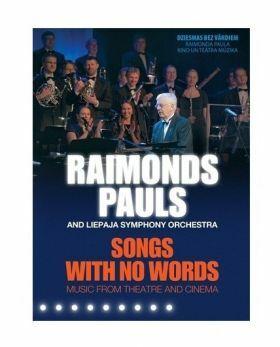 Out now – a unique DVD ‘’Songs With No Words,” which for the first time is dedicated solely to the superb piano musicianship of Raimonds Pauls. The DVD is a recording of a live concert, with Maestro and Liepaja Symphony Orchestra, from Dzintaru Koncertzale that took place 1st of Septemeber this year. One can hear, Raimonds Pauls, instrumental music from cinema and theaters that carry away the listener with their vivacious melody, simple yet bright imagery and heartfelt emotions coming from the composer. Before the concert Raimonds Pauls joked around, in his humorous manner, that he has always been an accompanist for performers – some talented, some very talented, as well as, not talented all, but this time he can shine as a soloist and pianist. Thinking about all of the fans of Maestro the DVD is available with Russian and English subtitles.